The future of the Santiago Calatrava-designed Greek Orthodox church at New York's World Trade Center looks uncertain, as the archdiocese has failed to pay construction fees. Work on the Saint Nicholas National Shrine, designed by the Spanish architect to replace a 19th-century building destroyed during the 9/11 terrorist attacks, has been suspended indefinitely. Construction had been underway for nearly three years, but site contractor Skanksa terminated its involvement in the project over the Greek Orthodox Archdiocese of America's (GOA) "defaults in making payment under the owner contract". The news emerged last week after Skanksa sent a letter to its subcontractors ordering them to stop work immediately and leave the site, which was then obtained and published by The Pappas Post. Skanksa – the firm behind the original World Trade Center towers and Calatrava's Oculus transportation hub on the site – then issued a statement confirming the termination. It cited a string of issues with the poor financial management within the GOA, which had been fundraising to reach the project's $40 to 50 million (£29 to 37 million) price tag. 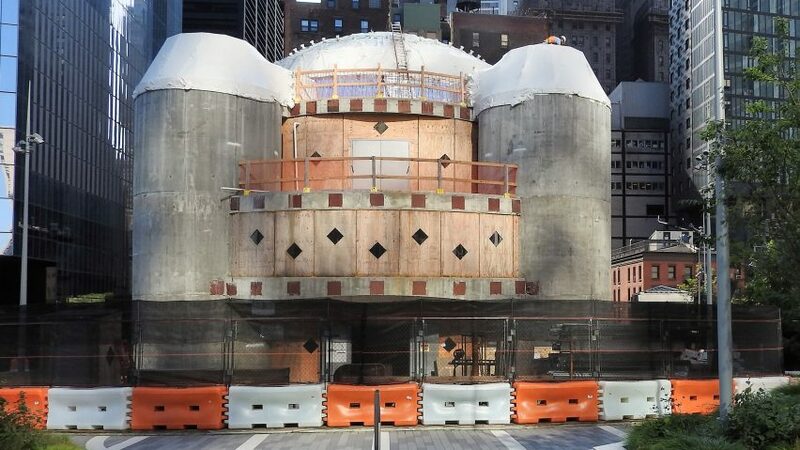 "In light of the Greek Orthodox Archdiocese of America's ongoing funding challenges, Skanska regrets that we must cease construction on the St Nicholas Greek Orthodox Church and National Shrine at the World Trade Center," said the statement. "This site is important to us – as it is to many people – and we have worked with the Archdiocese throughout its well-documented, recent financial difficulties to extend payment deadlines and discuss alternatives, all while continuing to construct the shrine." The Saint Nicholas National Shrine, which was intended to be largely built of white marble, has already taken shape at 130 Liberty Street on the edge of the National September 11 Memorial park. Its central dome-shaped structure was designed by Calatrava to reference Greek classical architecture. Final finishes, like a translucent skin that will light up at night, are still missing. The Greek Orthodox Archdiocese claims that it will continue working on these details off-site, and that the suspension is only temporary. "Even though construction will be temporarily suspended at the worksite in New York, development of integral aspects of the design and construction will continue in other places," said the statement. "The skylights in the dome are being constructed, as are parts of the marble and glass fused curtain-wall and lighting system that will encase the church and provide the glowing effect at night. Iconography is also currently being developed at Xenophontos Monastery on Mount Athos." The Saint Nicholas National Shrine is among a series of redevelopment projects at the World Trade Center site, including SOM's One World Trade Center, Richard Rogers' nearly complete Three World Trade Center and Fumihiko Maki's Four World Trade Center. BIG's Two World Trade Center tower and a translucent performing arts venue by Rex are still to come. Calatrava's Oculus also forms part of the masterplan, and has not been without its issues. Most recently, reports suggested the building sprung a leak due to inadequate finishes. Top image is by Jim Henderson.